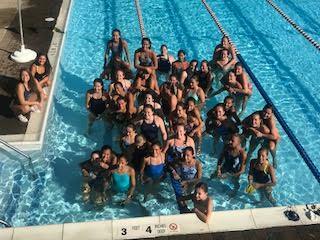 Photo caption: The Smithtown High School East/West combined girls swimming team recently raised approximately $9,000 for cancer research by participating in Swim Across America. Joined by the girls swimming team from Harborfields High School, the athletes raised money for the Nassau/Suffolk chapter of the organization. Proceeds from the swim will support immunotherapy research at the Swim Across America Laboratory at Memorial Sloan Kettering Cancer Center, lung cancer clinical trials at Cold Spring Harbor Laboratory, pediatric brain cancer research at Feinstein Institute of North Shore and pediatric oncology at the University of Texas MD Anderson Children’s Cancer Hospital.